Dimensions 0.25 by 4.25 by 7.50 in. 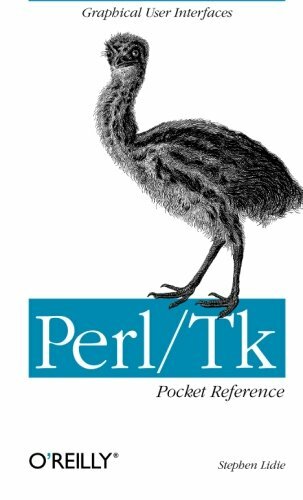 The Perl/Tk Pocket Reference is a companion volume to Learning Perl/Tk, an O'Reilly Animal Guide. Learning Perl/Tk is a tutorial for Perl/Tk, the extension to Perl for creating graphical user interfaces. With Tk, Perl programs can be window-based rather than command-line based, with buttons, entry fields, listboxes, menus, scrollbars, balloons, tables, dialogs, and more. And Perl/Tk programs run on UNIX and Windows-based computers.This small book is a handy reference guide geared toward the advanced Perl/Tk programmer. Novice Perl/Tk programmers will find that its compact size gives them a global view of Perl/Tk's capabilities; they can then turn to Learning Perl/Tk for details. The Perl/Tk Pocket Reference describes every Perl/Tk graphical element, including general widget and variable information, callbacks, geometry management, bindings, events, and window management, as well as composite widget, font, and image creation and manipulation commands. About: A companion volume to Learning Perl/Tk describes every Perl/Tk graphical element, including general widget and variable information, callbacks, geometry management, bindings, events, window management, and megawidget, font, and image creation and manipulation commands.